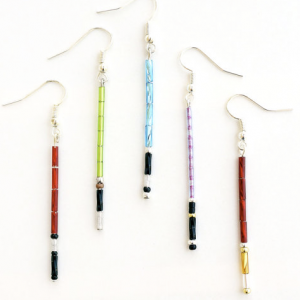 Check out these geeky lightsaber earrings my wife made! 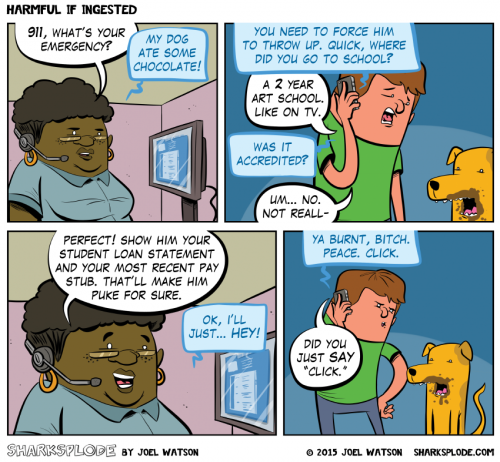 This is the final #1stPanel comic using the suggestion is “A man with a dog calls 911.”. I hope you’re enjoying this weird little experiment while I am away at New York Comic Con. My Patreon Patrons got ENTIRELY different comics than the ones posted on this site. You got five comics this week, and they got TEN. 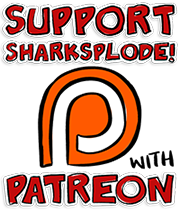 Sign up to be a Patron and you’ll get them all too! Patrons: Here’s your exclusive bonus alternate version of today’s comic! Do you want A TON of bonus, extra and alternate comics?! Then my Patreon is THE PLACE for you. Every little bit helps me continue to make a living, and is QUITE appreciated. I’m traveling for most of October/November, so it’s time for an EXPERIMENT. I asked Twitter and Facebook for the first comic panel ideas. Then I take those and make an entire comic that comes AFTER that first panel! 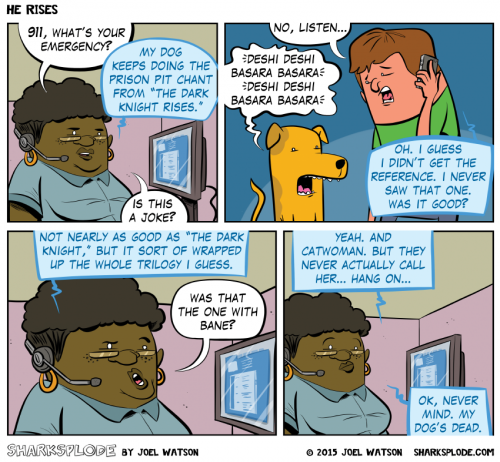 For this week the suggestion is “A man with a dog calls 911.”. My Patreon Patrons will be getting ENTIRELY different comics than the ones posted on this site. You’ll be getting 4-5 comics this week, and they’ll be getting TEN. 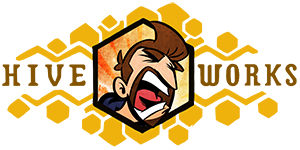 Sign up to be a Patron and you’ll get them all too! I have enough suggestions to go for months, but if you want to toss yours in the mix, please do it via Twitter, @hijinksensue and using the hashtag #1stPanel. I’m traveling for most of October and into November, so it’s time for an EXPERIMENT. I asked Twitter and Facebook to give me ideas for the first panel of a comic. Then I take those ideas and have to make an entire comic that comes AFTER that first panel! 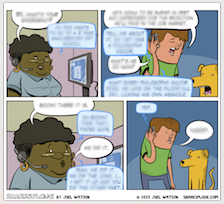 For this week the suggestion is “A man with a dog calls 911.” Since I’m at NYCC this week, I’ll be mostly reusing the art, but the dialog is all new. Do you want A TON of bonus, extra and alternate comics from the ones that appear on this site?! Do you want to support my ability to make a living from creating weird comics?! Then my Patreon is THE PLACE for you. Every little bit helps and is QUITE appreciated. I’m going to be in New York for NYCC all week, and almost immediately after I get home, I’m going to Austin, TX for Webcomic Rampage. This means this week we’re going to try an experiment. Last weekend I asked Twitter and Facebook to give me characters, settings and situations for the first panel of a comic. No dialog, no references, and just very simple set ups. Then I have to make an entire comic that comes AFTER that first panel! For this week I am going to try to make FIVE COMICS based on the suggestion “A man with a dog calls 911.” Since I’m going to be at a convention booth 10 hours a day, I will mostly be using the same art… mostly. I’ll toss in some weirdness where I can. 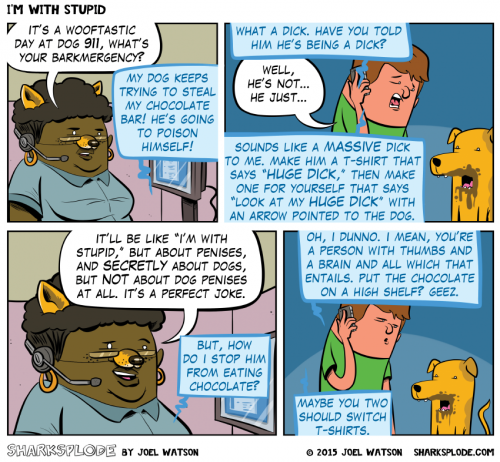 In fact, they can see an alternate dialog version of this comic, RIGHT NOW! I am traveling for most of the rest of the month of October and the first week of November, so I hope you guys enjoy the #1stPanel comics since they will likely continue through October and into November. Hell, it’s been pretty fun so far. This might BECOME what Sharksplode IS. We’ll see. I have enough suggestions to go for months, but if you want to toss yours in the mix, please do it via Twitter, @hijinksensue and using the hashtag #1stPanel.